It’s 1995 and two scientists are poised to unlock an enigma: the source of Earth’s magnetic field. Without this invisible barrier, life on our planet would be impossible, wiped out by the violent onslaught of solar wind and cosmic rays. But what causes magnetism? And what makes Earth so magnetic? For centuries this has absorbed the world’s greatest scientific minds. Albert Einstein called it one of the last great unsolved mysteries of physics. Now, using a supercomputer, these scientists will attempt to simulate Earth’s magnetic field, everything known about it from four hundred years of direct observation and geological records stretching back to the beginning of time. Their results will stun the scientific community. This engrossing book tells, for the first time, the complete story of the quest to understand Earth’s magnetism from the fascination of ancient Greeks with magnetised rocks to the astonishing modern discoveries that finally revealed the truth. North Pole, South Pole gives us an extraordinary window into science, passion and the brilliance of the human mind. Check out Awa’s own interview with Gillian here. North Pole, South Pole has been shortlisted for the 2011 Royal Society Science Book Prize! “GILLIAN TURNER…has a wonderful way of explaining difficult ideas in simple language. 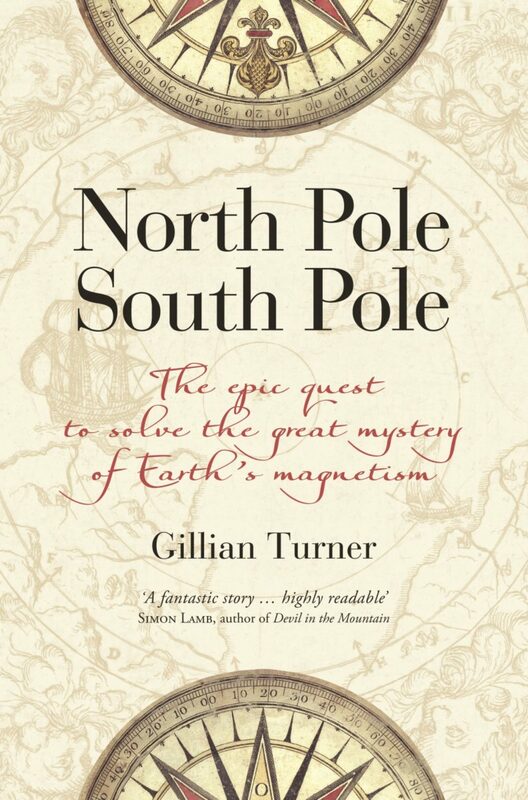 Her new book “NORTH POLE SOUTH POLE” covers the epic quest to solve the great mystery of the Earth’s magnetism. It is clearly written & beautifully illustrated…” – Ruth Todd, Plains FM.